In order to design usable and efficient interfaces, hurdles of interacting with our system or contents should be minimized. And some of this burden is often caused by small details that could be easily solved once we are aware of them. For example, indicating the videolecture length within the video title would allow students to easily assess the time they will need to watch the video, and decide if they want to start it or not, without having to open the video and wait until it is loaded to check the timer. Providing a unique numeric code for each videolecture based on Week number and Video number within this week will allow students to easily identify and position each videolecture within the course. If we start each week with a video labeled as 1.1, it will be more complicated for the students to identify all the videolectures from the same week, specially if they have downloaded them. Finally, we should be consistent in our decisions, labelling the videolectures of some weeks with numbers but not including numbers in videolectures titles from other weeks could be confusing. It is not necessary to include the whole words “Week 2 Videolecture 2”, using the abbreviated form “2.2” will save a lot of space that could be used to display a descriptive title about the videolecture content. Labeling videolectures with the week and video number provides some valuable information but students should also be able to easily see what is the topic of each video. A descriptive title about the content of the videolecture would help students that are only interested in certain topics and those that want to rewatch a videolecture to review one topic or concept. And I would say it is even more important to correctly label the video files and slides to download, because once they are downloaded, in the user computer, each video will not have any context or permanent order, so the only infomration available will be the file title. Thus, appart from the number of the week and videolecture, and the descriptive title, I would even consider including an abbreviation of the name of the course at the end of the videolecture title. As commented in the introduction of this post, indicating the length of each video will help students decide if they have enough time to watch the video at that moment or not, or even pick a shorter one instead. When you watch a videolecture the system automatically displays a check icon to show you that you already watched or downloaded a videolecture. That is really useful to remember where you were last time and what to continue with. One improvement that could be considered in this field is to implement different icons for “completely watched”, “partially watched” ( maybe with a progression bar), and “downloaded” videolecture, so users can differentiate among these three states. To support productivity, and avoid monotonous and repetitive work, enterprise applications often include the possibility to perform some tasks jointly for more than one item. In MOOCs, offering the users not only the option to download each videolecture individually but also to download all videolectures of the week/course with one clic, could save some users a lot of time and unnecessary clics. The same would be applicable for slides. In fact, I would even recommend providing an additional slide document for each week that aggregates the slides from all videos of the week. Having a lesson divided in 10 short videos could be convenient, but having the slides of one lesson in 10 different documents does not seem really handy. Besides usability and productivity, we can also think of other details to make MOOCs a more engaging and enjoyable experience. For example, to enhance the experience of the videolecture page, we could be to offer a bonus videolecture that will only get available (unlocked) once the student completed some steps or prerequisites. Do you have other ideas that could improve the UX of videolecture sections? 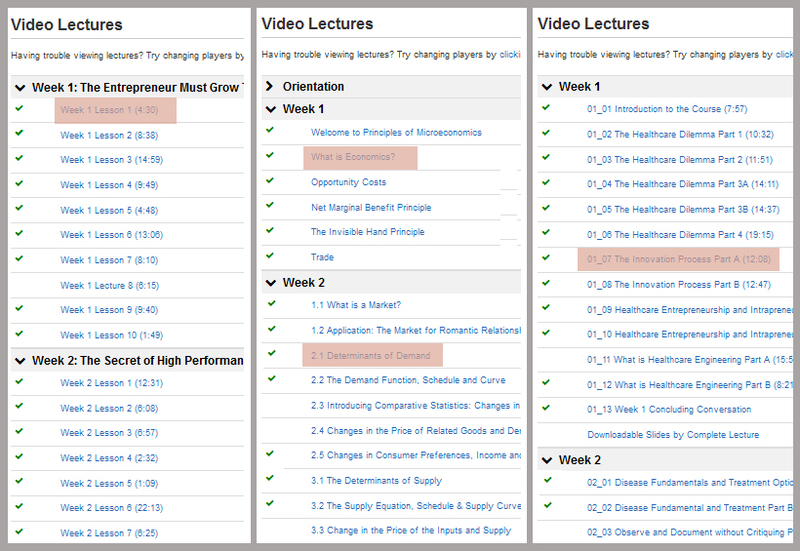 Categories: Videolectures | Tags: consistency, labels, numeration, Small details | Permalink. UX professional passionate about User-Centered Innovation!